As a baseline photo of the double-ender ferry entered a second life in 1937 as a derrick boat or “crane ship,” I offer this shot I took in Lyons in March 2018. That’s snow in the foreground. In one of her most notable roles, she assisted in the clean up near lock E-12 after the Thruway bridge collapsed into Schoharie Creek, an event I recall vividly because I traversed that bridge just the day before. you see in this photo of the stern prop. The rest of these photos come from Bob Stopper. 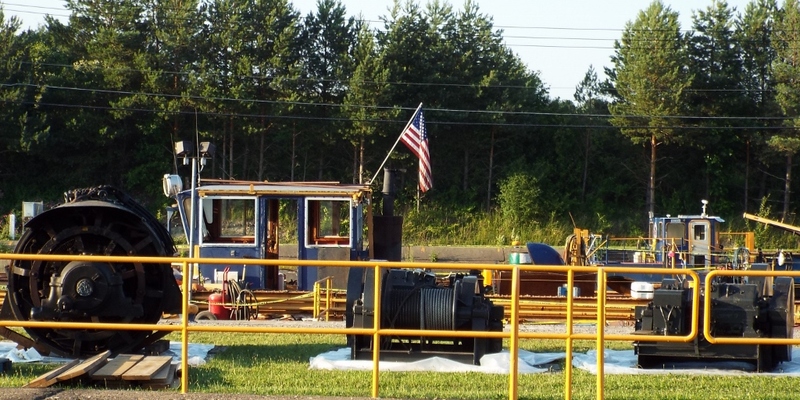 Notice the glass has been removed from the wheelhouse, but the flag still flies. 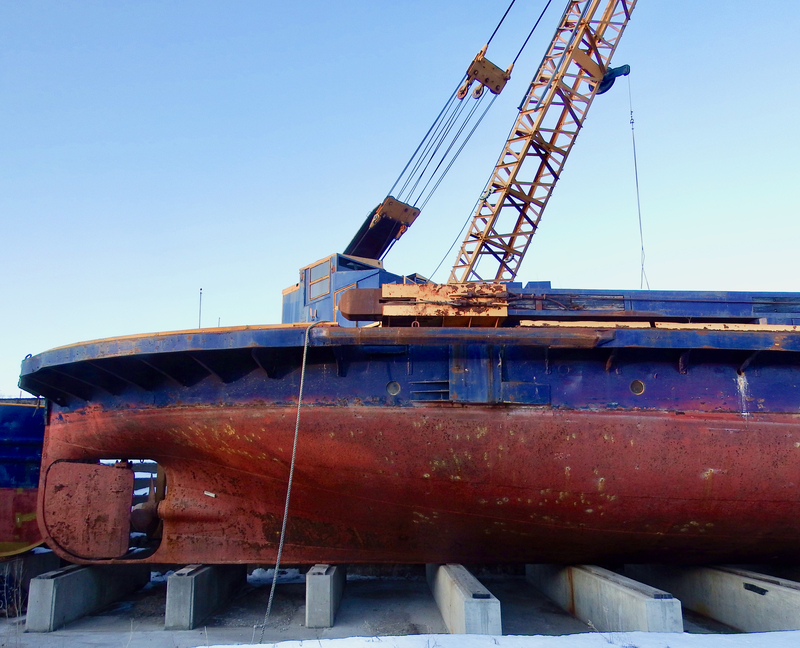 Little by little, its crane abilities are removed and placed alongside the dry dock. 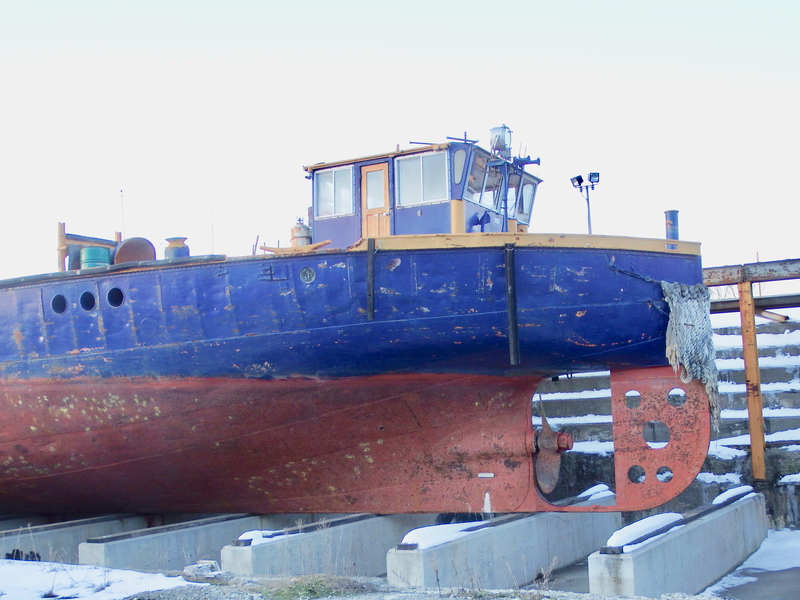 but eventually the once crane ship looks more like a curvaceous barge. 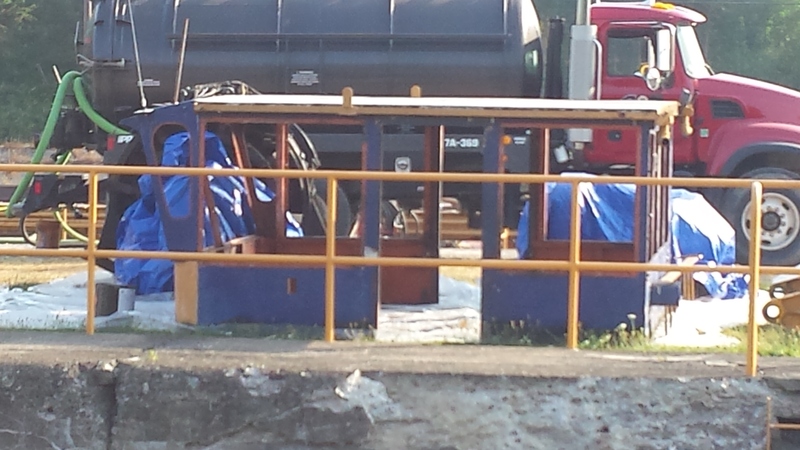 Who knows whether these props will be reefed along with the ship . . . .? 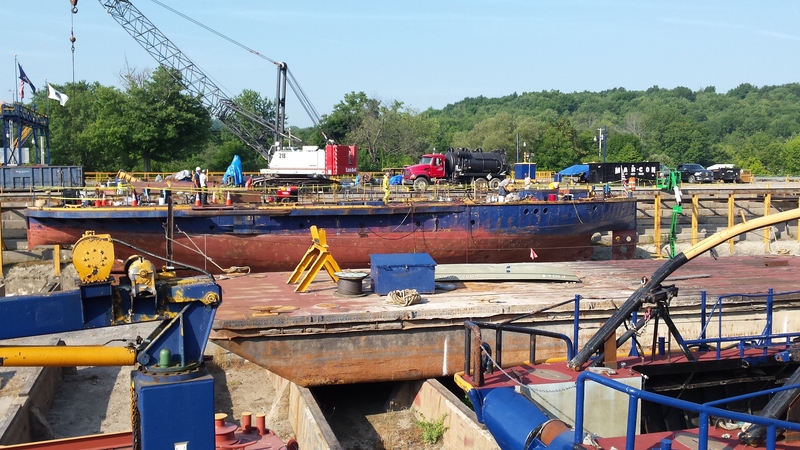 A tug is expected to arrive in Lyons imminently to move this vessel from central–almost western New York–to tidewater, then down the Hudson, and out to the designated reefing ground. And in other news from Lyons, here’s who showed up late Tuesday afternoon . . . with some new signage on the stack and engine cover. Compare with here from a month ago . . . 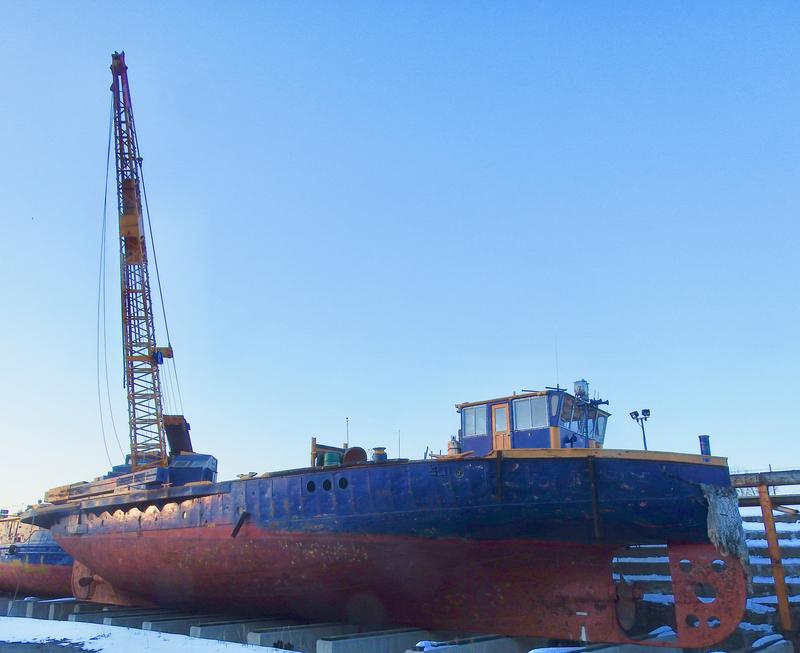 The departure of Ward’s Island will leave an open dry dock position into which the nearby tug Grouper may be towed for dismantling and scrapping. 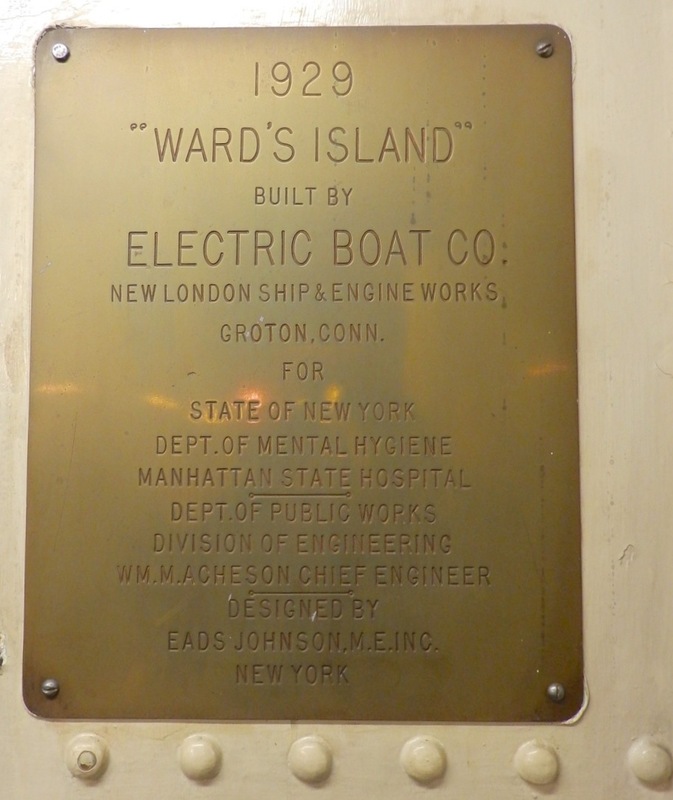 Ward’s Island was built by Electric Boat, so that may be why the stern rudder arrangement so resembles that of a submarine from the 1920s or 30s. Likewise, I would guess that both props were turned by generator-driven motors in submarine style. 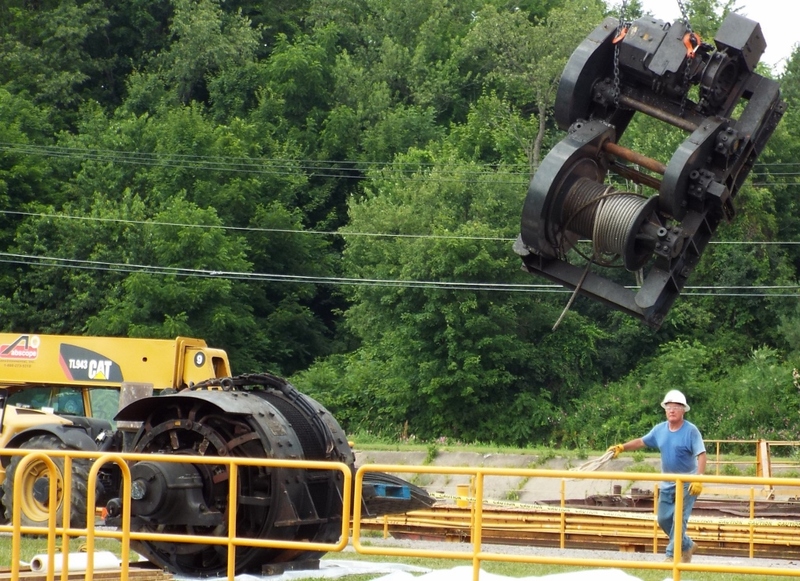 One of the internal mechanical artifacts arranged on the dock appears to be a large electric motor built in the open-frame style so typical of that period. 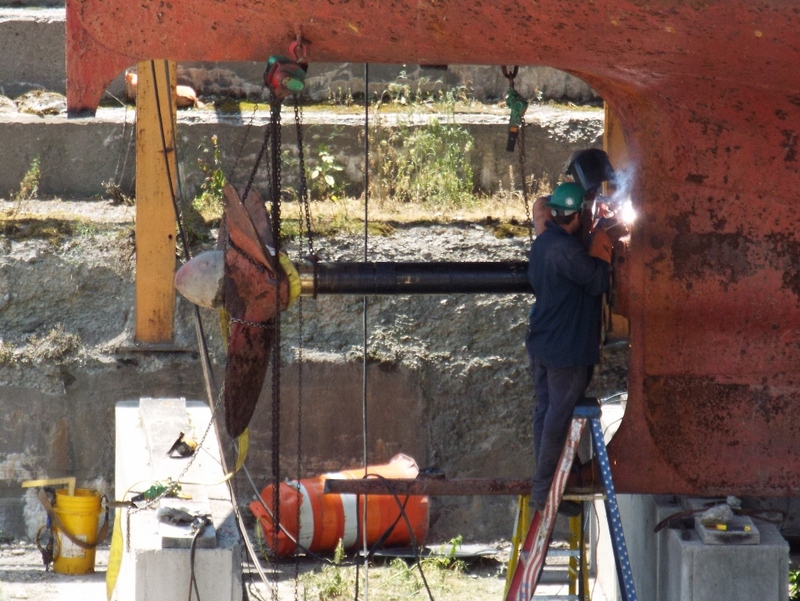 With the scrapping of all these specialized dredge and crane vessels, it seems that the Canal Corporation is not as concerned with maintenance and repairs as they used to be. I suppose that henceforth they will be relying on outside contractors for emergency repairs like bridge collapses and canal wall breaches. Environmental restrictions make dredging much more complicated than it used to be, so the most likely result will likely be minimal dredging and the continued silting of canal channels… perhaps to the extent that the waterway eventually reverts to the original four-foot depth of Clinton’s Ditch. So Grouper’s time may be upon us? 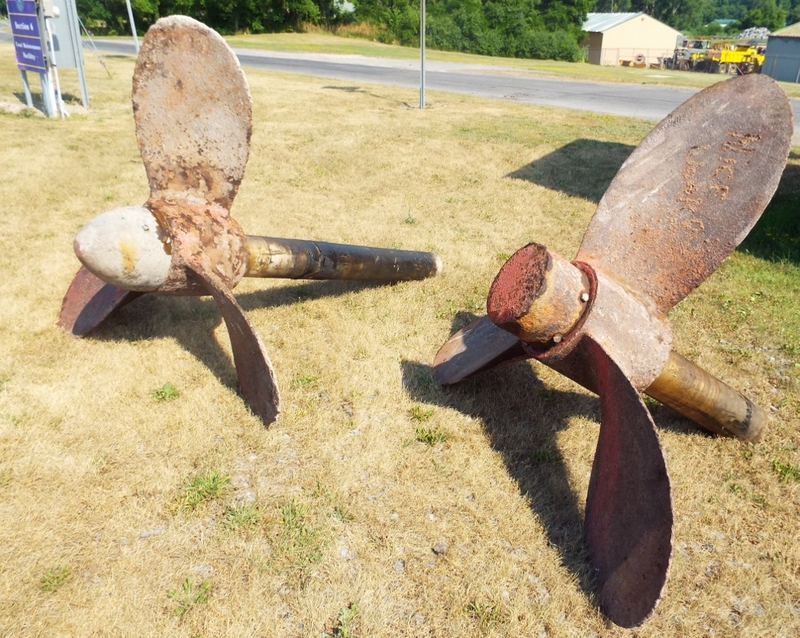 Looking at those props, I wonder what happened to the fairwater on the right hand one? I suppose this was the bow and unused screw? 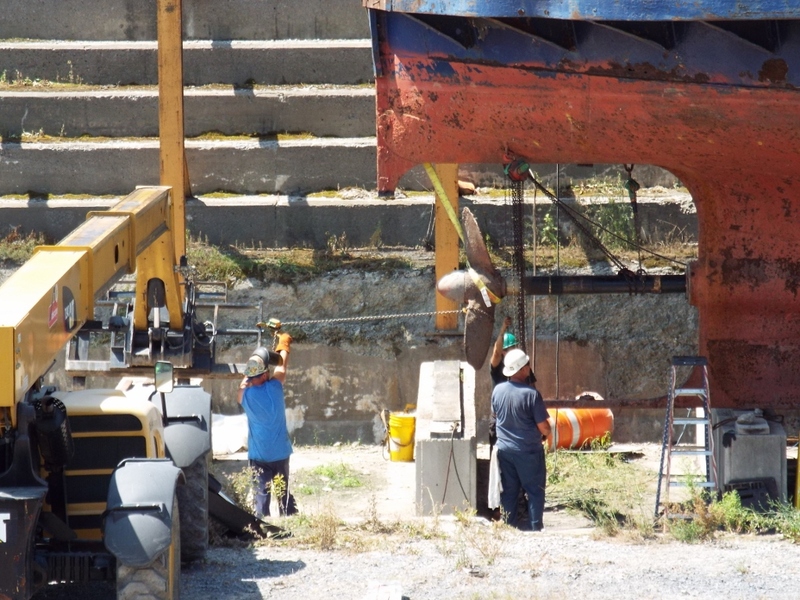 Dredging of the canal is an interesting conundrum, one would think doing it off season when the canal is drained would be a reasonable and less complicated solution? Thank you for the update on Jay Bee V’s epic voyage! 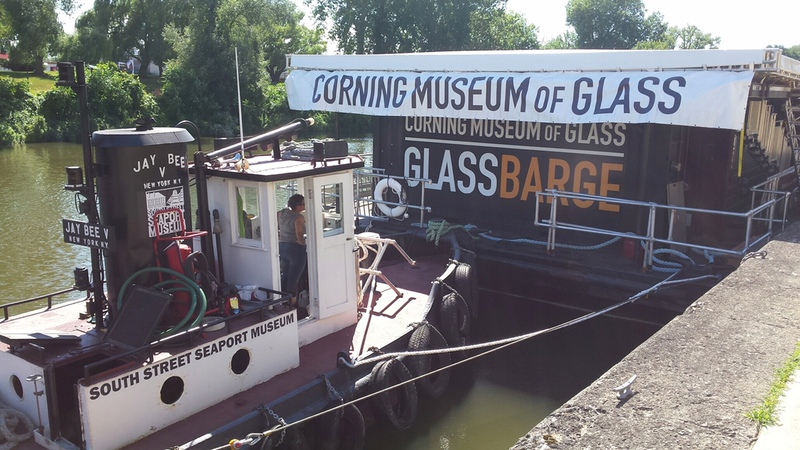 I guess we won’t have preservation expenses once Governor Andrew Cuomo is through cleansing the canal of its maritime heritage. Maybe they will even take the Day Peckinpaugh. This may free up some money for more bike paths and art projects by connected NYC artists. Cuomo is a transformative personality.